Given that I'm white and an atheist, it's probably fair to say I'm not the target audience for BLACK NATIVITY, the second of three African-American Christmas movies being released this year. But you know what? Whether the filmmakers were aiming for me or not, they won me over. Although ostensibly based on the play of the same name by Langston Hughes, BLACK NATIVITY gives barely a nod to its source material, an Africanized telling of the birth of Jesus. Instead, it tells a new story about Langston Cobbs (Jacob Lattimore), a young man whose mother Naima (Jennifer Hudson) named him after the famous writer/poet. As the film begins, these two are being evicted from their home in Baltimore. Seeing few options, Naima sends her son to live with his grandparents, the Reverend Cornell Cobbs (Forest Whitaker) and his wife Angela (Angela Bassett), while she tries to scrape together enough money for a new place to live. Naima and her parents haven't even spoken since before Langston was born, the reasons for which will not surprisingly play a major part in the plot. Equally unsurprising is Langston's difficulty in adapting to his new situation. While not a bad kid, Langston considers various illegal schemes that he thinks might get him the $5000 necessary to save his home, and the seemingly shady character of Tyson (Tyrese Gibson) seems inclined to help him in that direction. If only some sort of Christmas miracle might occur. Okay, that last sentence was a bit snarky. What makes BLACK NATIVITY stand out from being just another throw-away holiday film are the songs. 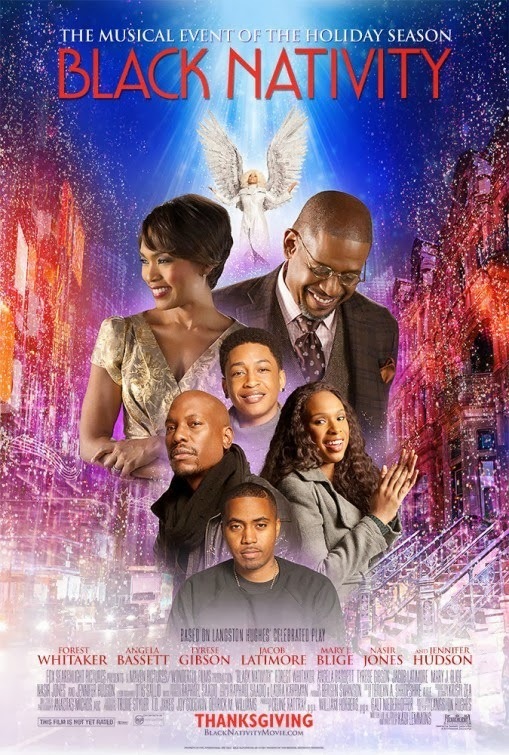 Unbeknownst to this reviewer, having gone into the film relatively cold (a luxury the Hollywood hype machine makes increasingly difficult these days), BLACK NATIVITY is a musical. The soundtrack is a mix of R&B, gospel, and hip-hop (often blending together), and with excellent vocalists like Hudson, Bassett, Gibson, and Lattimore (plus a not too shabby Whitaker) in the primary cast, it sounds pretty darn good. That, and they can all act, too. It also helps that director Kasi Lemmons (helmer of EVE'S BAYOU and a personal favorite of mine, THE CAVEMAN'S VALENTINE) has an arresting, though not overbearing, visual style. As for the core message, it's basically that faith, forgiveness, and family are the keys to happiness. So yeah, it's definitely an unapologetically Christian film. Given how so many movies these days are afraid to take any kind of moral stance, though, I actually found it kind of refreshing that BLACK NATIVITY doesn't try to water down its themes. There isn't so much emphasis on religion here that a heathen like me felt uncomfortable, but the film is nonetheless upfront and proud of its beliefs, and I respect that. Sure, the plot is predicable and contrived and the ending is more than a little pat, but what do you expect from a feel-good holiday movie, be it secular or religious? BLACK NATIVITY delivers exactly the kind of warm-hearted Holiday entertainment anyone going to see it is likely hoping for. 3 out of 4 stars.